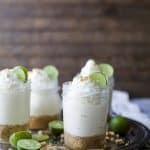 Easy No Bake Key Lime Cheesecake made healthy by using greek yogurt. A perfect light summer dessert to wow the crowd! In a small bowl add, cream cheese, greek yogurt, honey, vanilla, and key lime juice. Using a hand mixer blend until the mixture is smooth and creamy. (like cheesecake .. wink) Set aside. To a food processor add graham crackers. Blend until graham crackers are crumbs. Pour into a small bowl, add melted butter. Mix together. Evenly distribute the crust among five 8 oz. mason jars. Pat the crust down. Next, evenly distribute the key lime cheesecake among the mason jars. Cover with plastic wrap and place in refrigerator for 1 hour. Garnish with whipped cream and serve!